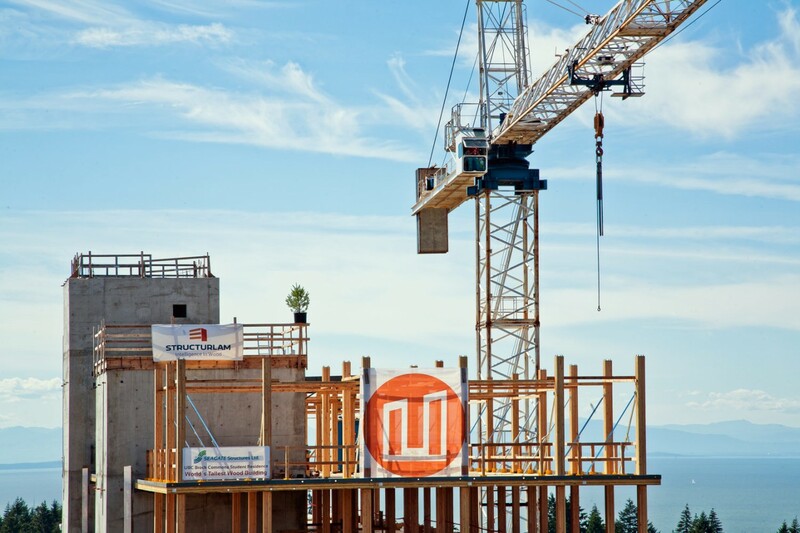 As record breaking Mass Timber structures are being erected across North America, and with the recent changes to the BC Building Code to allow Mass Timber buildings of up to 12 storeys, we’ve compiled some fast facts about Mass Timber to ensure accurate information is available. The truth is, Mass Timber is a safe, fast and sustainable construction solution and the diversity of options is a positive thing for development. Below are four common Mass Timber concerns, paired with some interesting facts you may not know about the material, and why we believe it’s here to stay. Multi-story structural fire tests lasting over 4 hours have been performed in both the US and Canada under the direction and supervision of national fire chiefs, proving Mass Timber structures are tried and true. Wood chars at a predictable rate, protecting the structural members beneath the char and providing a safe structure with known fire performance and life safety outcomes. Strict fire regulations are enforced in Mass Timber buildings, requiring non-combustible materials, sprinklers, offsets and strict performance-based testing to ensure fire doesn’t spread to other buildings or compartments. Required by code, Tall Wood buildings must be fully sprinklered – a mandate that also exists for concrete and steel structures. Regardless of firefighting equipment and personnel, sprinklers are always the first line of defense in a fire event. Mass Timber buildings have the potential to be designed as resilient structures with superior performance in a seismic event – they can be quickly assessed and repaired, allowing for immediate re-occupancy after a seismic event. Mass Timber buildings incorporate resilient design and are often used for extreme conditions, such as blast proof or post-disaster status buildings. Mass Timber buildings are designed to meet the same performance and life safety standards as concrete and steel structures, with performance proven by both calculation and full-scale testing. Through a buffering effect called hygroscopicity, wood is able to tolerate high humidity and is capable of absorbing and releasing water vapour without compromising its structural integrity. As long as moisture content is below 20% in the structural wood, the risk of mold or fungal growth in Mass Timber structures is extremely low. Generally, the moisture content in a dry service condition will level out to between 7% to 9%, which allows the wood to maintain its structural properties for centuries as long as it has adequate weather protection. Backed by substantial research, wood is an energy-efficient, alternative construction resource compared to concrete and steel. Where a wood floor beam requires 80 megajoules of energy per square meter of floor space, steel and concrete need 516MJ and 290 MJ, respectively. A study that assessed the life cycle of building materials, used in both warm and cold climates, found that total life cycle energy emissions for wood buildings were 31% lower than comparable structures of concrete, and 26% lower than steel. Mass Timber buildings are roughly 25% faster to construct than concrete buildings, require 90% less construction traffic (trucks delivering materials), and 75% fewer workers on site. This is primarily due to the fact that Mass Timber panels are prefabricated and then assembled on site, significantly cutting down on project timelines and deliveries, and ensuring safer and much quieter construction sites. Mass Timber buildings have 1/3 of the greenhouse gas warming potential of concrete buildings, and nearly ½ that of steel buildings. Wood facilitates carbon sequestration – the process of absorbing and locking away carbon within itself for decades, if not longer. For more information about Mass Timber solutions, please visit www.structurlam.com. More about fire safety and Mass Timber can be found here: www.structurlam.com/resources/testing. American Wood Council . (2015). National Design Specification for Wood Construction. CSA Group. (2017). o86-14 June 2017 Update, Engineering Design in Wood. Hasburgh, L., Bourne, K. J., Dagenais, C., Osborne, L., Roy-Poirier, A. (2016). Fire performance of mass-timber encapsulation methods and the effect of encapsulation on char rate of cross-laminated timber. (2009). X-Lam Earthquake Test. Youtube. International Code Council. (2017). Tall Wood Buildings – Codes & Standards Work Group Table 504.4. Kolb, J. (2008). Systems in Timber Engineering. Zurich: Birkhauser. Osborne, L., and Dagenais, C. (2015). Full-scale Mass Timber Shaft Demonstration Fire – Final Report. Québec. reThink Wood. (2017). Designing for Durability. USA. (2018). A CLT fire resistance test of the Estonian Academy of Security Sciences (ENG). Youtube. Think Wood. (2013). CLT Lateral Design (Seismic & Wind). Youtube. Think Wood. (2017). Building Better Sustainability. United States. Think Wood. (2018). 4 things to know about Mass Timber. United States. WoodWorks – Wood Products Council. (2018). Mass Timber Blast Testing Phase 2: Test 7 – 610 lbs of flake TNT from 75 feet with config changes #4.